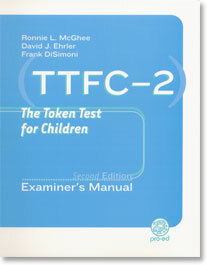 The TTFC-2 assesses a child's receptive language ability using 20 tokens (varying in size, shape and color) that are provided in the test kit. The tokens are presented in a standardized array and the child is to identify and/or manipulate the tokens in response to 46 spoken directions. The tasks are presented in order of length and increasing difficulty. Performance on the TTFC-2 reflects the child's understanding of standard English syntax, relational and prepositional concepts, level of semantic development, short-term and working memory. Administration takes about 15 minutes; detailed instructions are presented in the Manual as well as on the Record Forms. Raw scores are interpreted as standard scores, percentile ranks, and age equivalents.